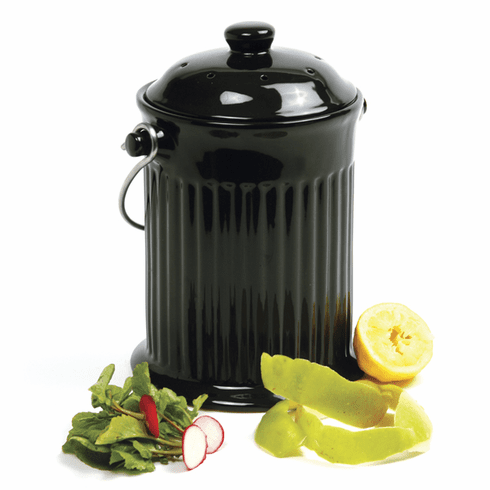 Attractive black ceramic compost keeper that will look good on any counter top. Has a sturdy stainless steel handle for easy transport. Measures10.5"/26.5cm tall. Capacity, 1G/4Qt/3.8L. Store peelings, egg shells, coffee grounds, greens, clippings, fruit and vegetable scrapes for transfer to your garden compost. Includes charcoal free odor preventing filter in lid. Use replacement filter #93F. Wash with warm soapy water, rinse and dry.